Have you ever felt a bit down or just generally depressed the morning after a night of drinking a lot of alcohol? If this is something that you can relate to you, then you will be comforted to hear that you are not alone. 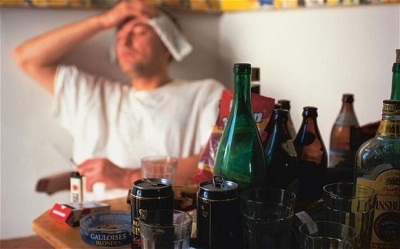 This feeling is termed as “hangover anxiety”, a state where you feel symptoms of anxiety following the consumption of alcohol. These symptoms can be both mental–feeling depressed and/or restless, or physical–aching, feeling dehydrated and nauseous. Below you’ll find out why anxiety after drinking is commonly experienced, as well as some things that can help you out if you are feeling like this. Depression after drinking. Studies show that after alcohol use, your brain exhibits chemical signs of depression at a cellular level. Susan Scholl, a professor of health at Syracuse University, emphasises that “Alcohol is a depressant drug… not only does it depress what’s happening for you at a physiological level, but it can also have an emotional after-effect.” This means that the drinking of alcohol can induce hangover depression. T o combat the memory lapses that come with rapid alcohol consumption, drinking a glass of water between alcoholic beverages will prevent your blood alcohol content from rising too sharply, in turn keeping your brain functioning properly. Drinking water whilst drinking alcohol will also prevent you from becoming too dehydrated. If this sounds like too much liquid for you at once, you can alternatively have a few big glasses of water before you go to sleep to ensure that you don’t feel dehydrated the following morning. Headaches can also be prevented by making sure that you are properly hydrated. While the main means of preventing hangover nausea is by drinking less alcohol, a natural plant extract found in the Holvenia Dulcis plant has been shown to reduce the amount of acetaldehyde that alcohol produces in your body, making you feel less nauseous.